Cancer Awareness Ribbon Colors - Crochet for Cancer, Inc. 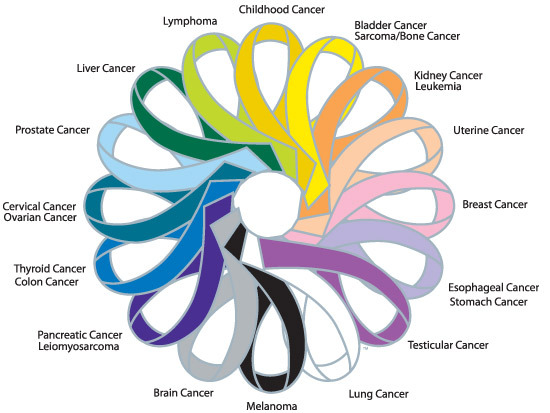 When I was browsing through a store in downtown Savannah, Georgia, I came across this image from Live for Life Hope For All that shows the cancer awareness ribbon colors. The store had it displayed on their wall and I instantly knew I wanted to research it. I found the organization and have posted the image below. I also found neat video online that explains how to crochet cancer awareness ribbons so I thought I’d give it a shot. Before I began I wanted to make sure I was choosing the right color that properly represented a specific cancer. Hope this helps you as much as it did me. I have also shared the video below.